It looks to me as if you're going at warp speed... making the whole project look downright easy (which I know it isn't). 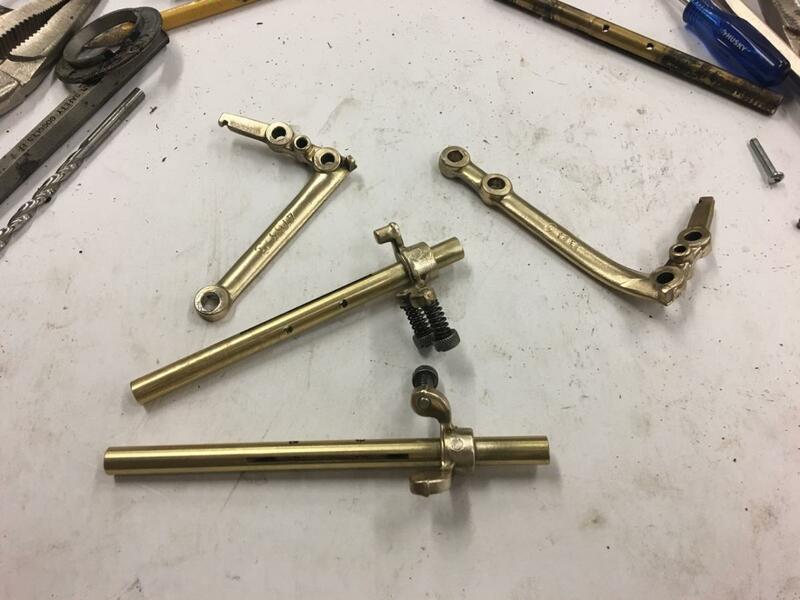 Thanks Joe, ordering parts sure is easier than making them!! Not much to report. Ran the brake lines and fuel line, hopefully didn't get them crossed. Identified more brass washers I was missing and ordered those along with other small various items that I can't figure out how I didn't know I would need. Getting ready to replace the throttle shaft bushings in the carb, should have the bushings mid-week. 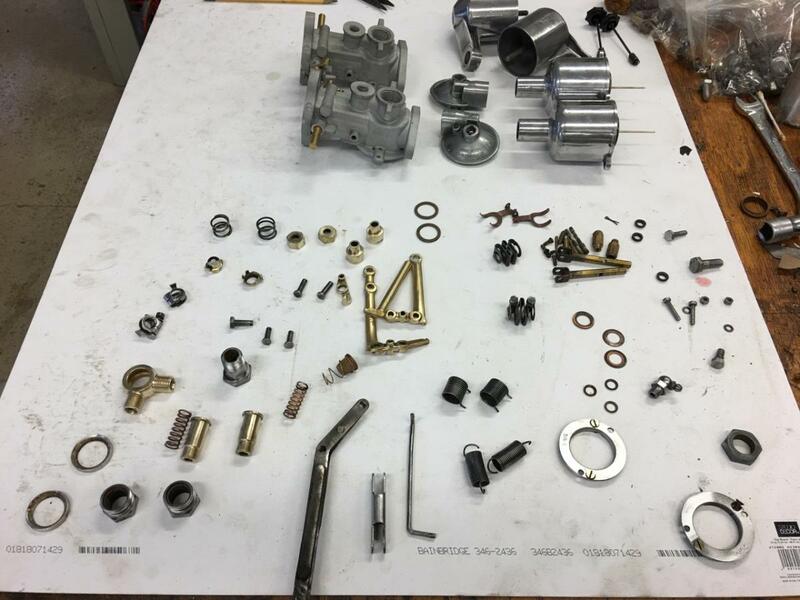 I think I have the rest of the parts to complete the carb overhaul but I thought that already, twice. I feel your pain. I ordered a new throttle shaft, as the old one is very worn. 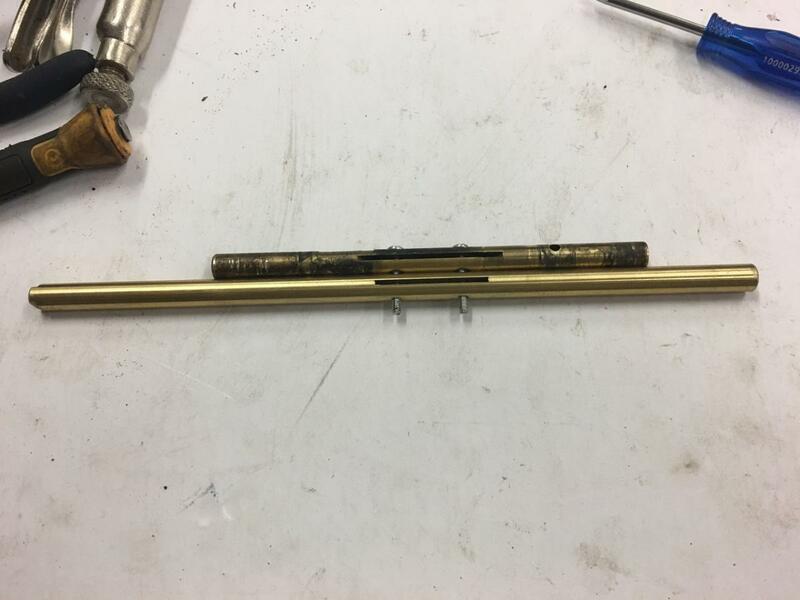 The shaft is too long and does not have a hole drilled for the idle stop lever, nor does the idle stop lever itself have a hole in it to pin it to the shaft. 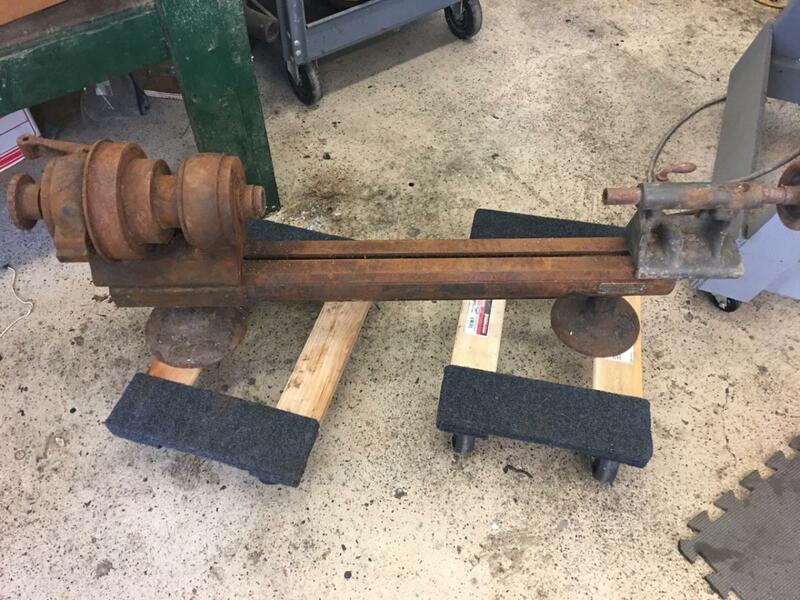 I took it to a machine shop to have it cut to length and the holes drilled. I've never seen a group of people so confused by such a simple job. I guarantee they will screw it up, so I'll probably have to take it elsewhere. Will end up losing at least 3 weeks of time for 5 minutes of work if it was at a competent shop. Please post photos of the carbs when you're finished! Yeah, just got the same shaft, way too long, no hole for the idle stop lever, etc, etc. I did manage to ream out the old bushings and press new ones in and the shaft is nice and snug now so I'm pretty happy about that. I won't be getting any work done this weekend as I am on a old machine tool hunt. I've found a few interesting items and I'll be driving about an 8 hour loop to look at them. Hopefully I can bring home some goodies. 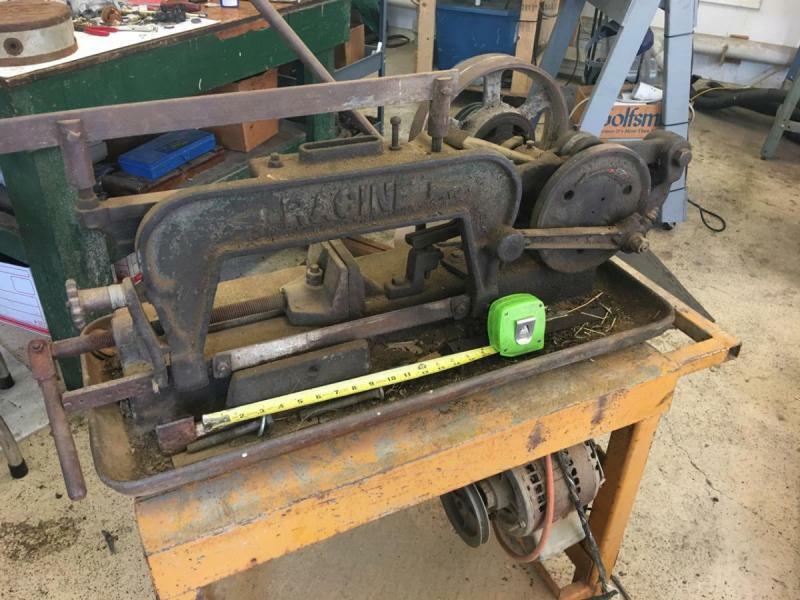 An old Racine power hacksaw is target number one and I feel good about that one. A very old Cincinnati Tool Grinder/Cutter is another target but I think it may be too far gone. Should be a fun trip. Hi, I would just like to say how much I am enjoying your reports on the MG TC restoration. 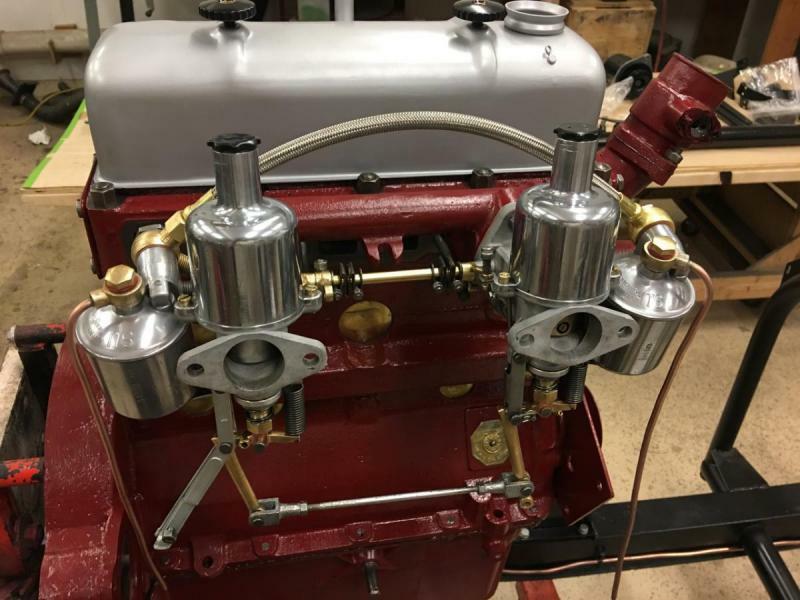 Having recently documented a series of reports for the MG Car Club V8 Register website, on my MBG roadster V8 rebuild, I appreciate the amount of work that goes into planning the restoration, the work involved and report writing. Keep up the good work. Hey thanks Mike! 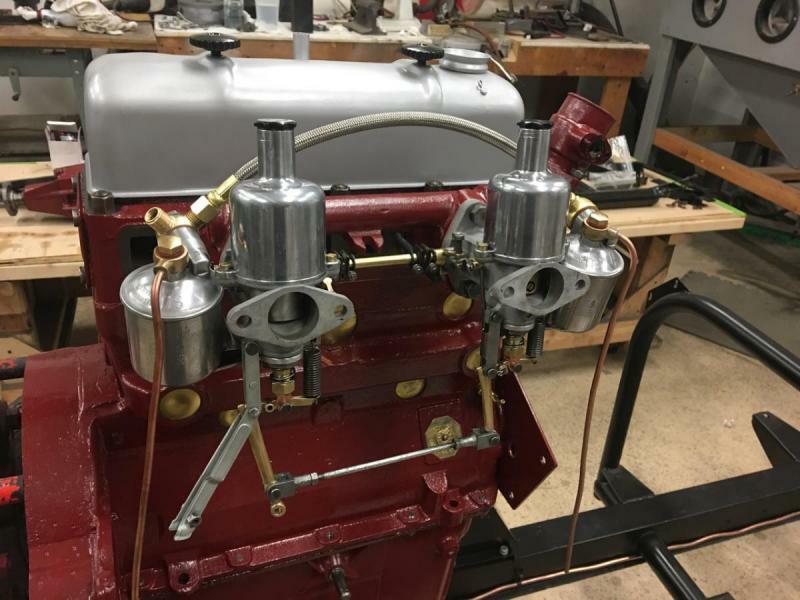 Please do post a link to you MGB V8 rebuild as I'm sure everyone here would love to see it. http://www.v8register.net/profileV8RebuildMacartney.htm Report 161 is an index to the reports. This week I have been helping a friend in our village with his MGTD which he has owned since the 1960's, the car was 12 years old when he bought it. He is having problems with 'heat soak' and the coolant boiling when the engine is switched off. In the UK we have some unusually hot weather at the present time, which is not helping his cooling problem. His TD is much more sophisticated car than the PA and TA models that I have driven previously. Trip went smoothly though I didn't bring home the tool cutter/grinder. It was pretty far gone and the power hacksaw weighed a good bit more than I thought so I was running close on weight. Had the grinder been in better shape I probably would have brought part of it back and then driven back up to get the rest of it and (if I'm being honest...) drag home the Kempsmith horizontal mill disaster. I wouldn't be surprised if I do go back up there and get both of them but for now my resolve remains strong. I did find a Hardinge Cataract bench lathe, a B&S magnetic check, bunch of hold-downs, lathe dogs, stainless bar stock, etc, etc. It was a great trip. The lathe looks worse in the pictures than it is. It was stored in a basement that had small streams running through it so the humidity was 100% and thus a lot of surface rust. I did manage to get the throttle shaft completed. I had some 4-40 screws that I was able to use to screw the old shaft to the new shaft. With them together I could put it in the vise and then adjust the rotation of the shaft such that the drill went clean through the old hole. Then it was just a matter of tightening the vise, switch the drill for a center drill, moving the cross slide over a bit, starting the hole in the new shaft, switching back to the drill and finishing it out. There was a little bit of eye-ball work needed but it went smoothly. With the old shaft connected to the new shaft it made it trivial to cut the new shaft to length. I media blasted the bodies (at low PSI as suggested by Bush Mechanic) and cleaned up some of the other parts. I silver soldered the holes in the worn holes in the levers (as suggested by 1912Staver) and drilled them back out. Still a lot more to do but moving along. Good stuff Jeff. We don't have very much of the old iron around here like that. I did manage to pick up my Bridgeport mill today from a company that is selling off 5 of them. They are making room for 4 new 5 axis CNC machines. It's a 2003 model and is in great shape with the longer table. Came with a DRO, collets, and a Kurt vise. Sold my old worn out 1962 Bridgeport model to automotive repair shop. Good luck on your new toys. One other small task completed as well. 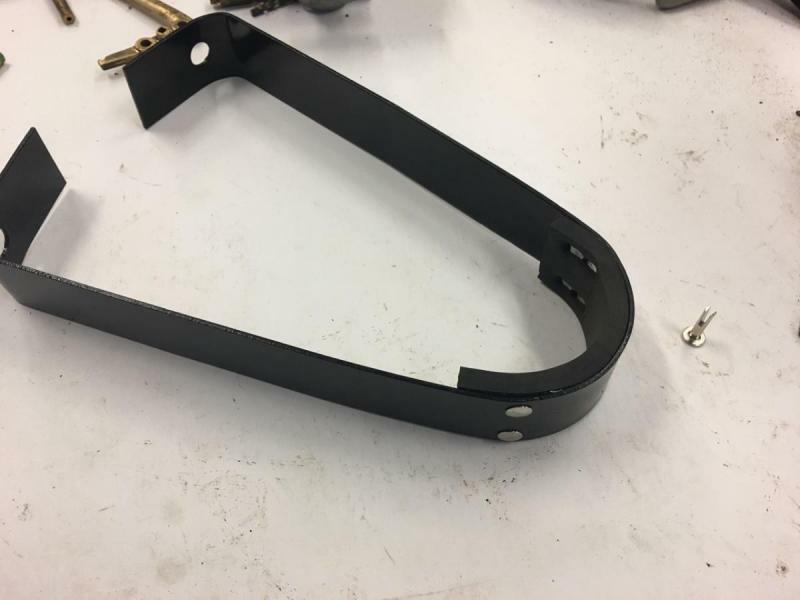 The rear axle has check straps and those check straps have a strip of rubber in the bottom where they go around the axle. Obviously the rubber in mine was long gone. Unfortunately Moss doesn't see replacement rubber rather they sell new check straps for about $45 a piece. That's probably a great deal if you don't already have the strap, but for just the rubber and rivets it seemed like a lot. It took forever to find split rivets that had a big enough head but I finally found them and they worked perfectly. Another small task complete. Wow, that's fantastic!! A 2003 Bridgeport, Kurt vise, DRO and collets... simply amazing! The area I live in is pretty much an old iron desert as well. It is rare to find old tools and when you do they're usually back in the mountains and have been seriously neglected. I've yet to find a vertical mill. When I first started looking for one I saw a mint Index mill for $850. Since I had just started looking and had no idea what a mill was worth I didn't know it snap it right up. I had my chance and missed it. I kick myself for that pretty often. 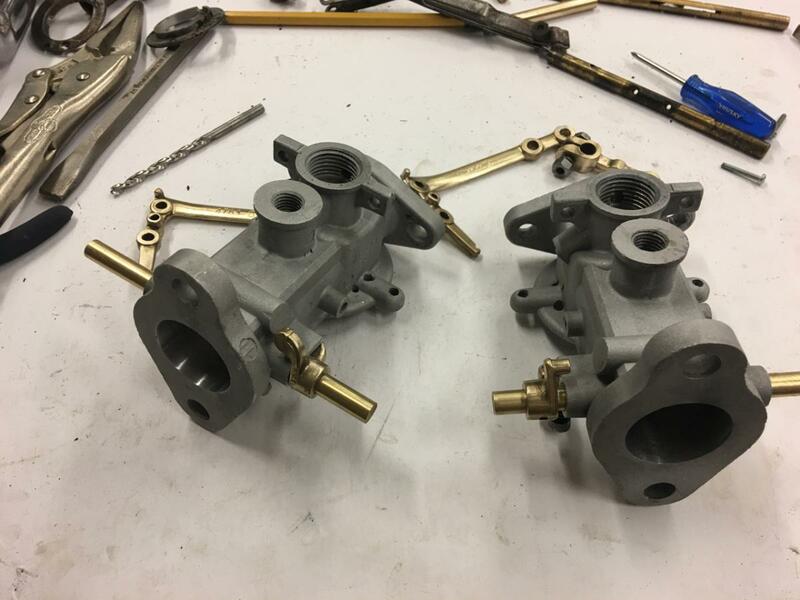 Jeff, we both did the same exact project yesterday, except I had to farm my throttle shafts out. Great work! Nice to have all those great tools, so you don't have to deal with some of the bozos I've had to deal with. My first machine shop drilled the hole too far away (so the shaft and throttle plate would move laterally in the bore) and he drilled the hole in the idle stop lever at the wrong angle, so destroyed both parts. Found another machine shop that did the job perfectly in 3 hours. The first place took 3 weeks and destroyed all my parts. Again, fantastic work. Now I can start copying what you are doing since you've just about passed me by. You've been doing a great job leading, I vote you stay in front! 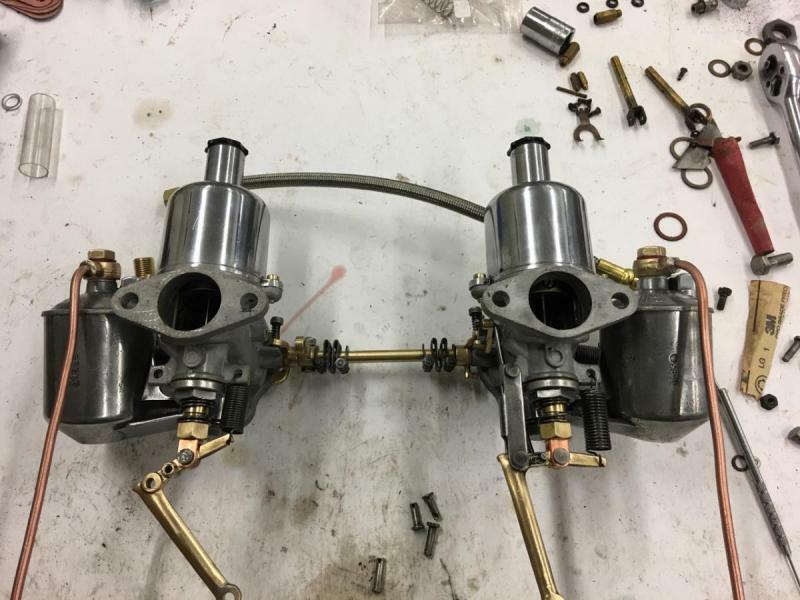 Got a little time in today and managed to get the carb parts cleaned up. Unfortunately when I took the carbs apart I didn't take a lot of pictures. I figured I'd be swapping in the new parts and putting them back together almost immediately. Life interrupted and now I'm looking at a puzzle. I've got a reasonable exploded parts diagram and a few pictures so I should be able to manage. Is is typical that the *one* time I didn't take a lot of pictures would be the time that this happened. I have this book which I could photo copy of any drawings you need. 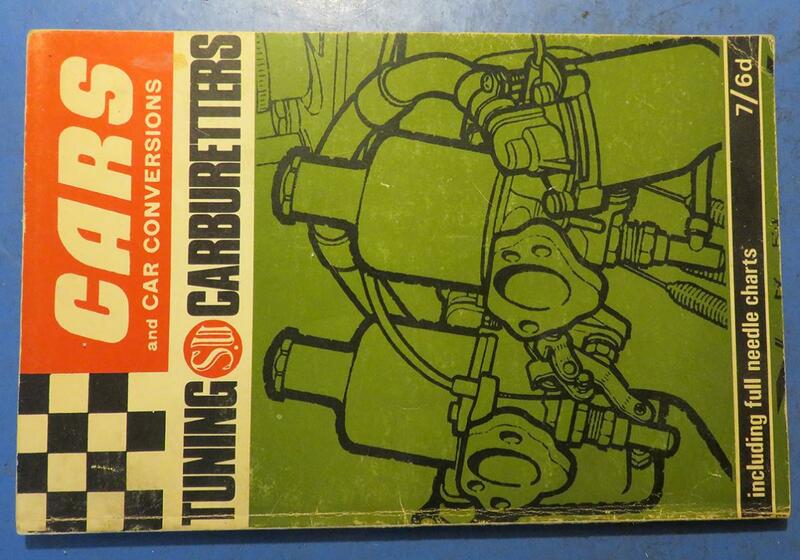 I recently used it when I overhauled the SU carbs on Arkley. However many photos and notes you have taken, there is always one photo you didn't take! Pretty close to being finished. I needed to plate a couple of linkage pieces so I'll add those tomorrow. I have no idea if I did it right or if they will work, but I was able to follow all the steps (sucarbs.co.uk is a great source along with Joe's site) and was fairly confident that I was doing what the directions said to do. I'm cautiously optimistic that'll they'll work with a little tuning. Done!!! or so I thought. Mounted these guys on the engine to see how they looked and noticed that I have the linkages backwards.. I'll pull it apart tomorrow and swap them, will need to go get 5000 small stainless cotter pins. Those things are miserable to work with. That really looks good - and while cotter pins may be a headache to work with but they make the job look REALLY finished. Practically everyone left them out. I think I would have used that cast aluminum accessory valve cover. 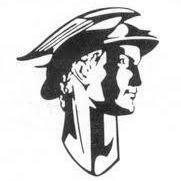 I had a new one years ago that I was given by the parts department where I worked as they were no longer an MG dealer. I suspect it was a dealer supplied option. At the time, I was told it was for a TD although I used it on an MGA. They also gave me a NOS set of TD hubcaps for the steel wheels. Thanks Joe. I could still use the other valve cover, I didn't think about it. When I saw it was different I just assumed that it was because the parts car was a year older. I'll check into that... it is a good idea. Those SU's look very neat. And the brass fittings set them off nicely. You should have no trouble picking up a pair of original brass damper lids to finish them off. Well done, mate. Took the choke linkages off to switch them and while doing so noticed there was a lot of slop in the whole system. First part of the problem was I didn't get the needle/jet sealer nut tight enough. Once I got that tighter it would pivot correct but, of course, that meant the jets were not centered anymore. Had to take the dashpots back off and go through the centering process again. I found a fairly simple way of doing so. 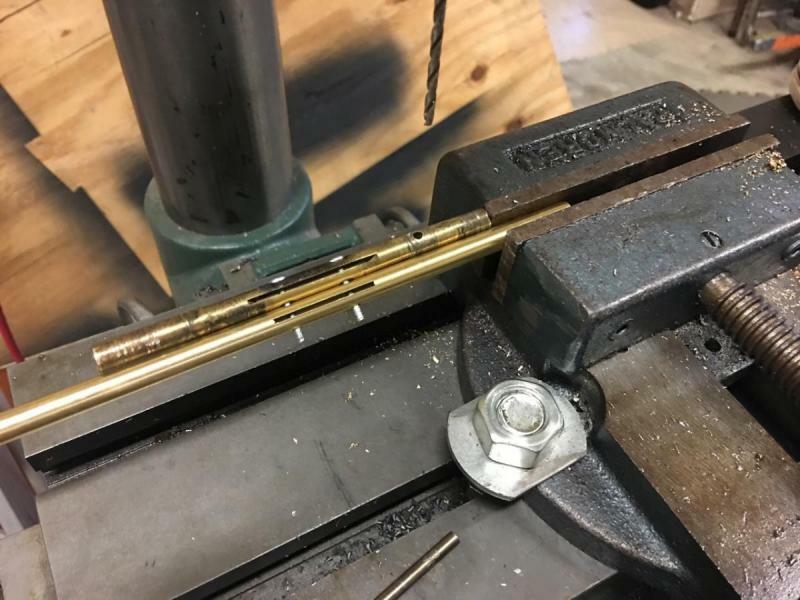 While Moss sells a tool I forgot to buy it, instead I got some shim stock and formed a metal straw of sorts. I stuck that between the jet and the main body which, in effect, holds it centered (as these are concentric circles all I'm doing here is filling in the gap so the inner 'circle' can't move). After getting that together there was still more slop than I wanted. I noticed that the previous owner had replaced one of the pins in the linkage with a bolt. I replace the bolt with the proper pin but what I didn't notice was the PO had enlarged the hole to get the bolt in. I turned a new pin, drilled a hole for the cotter pin and that cleared up the problem. So now I'm done with the carbs, again. I need to bake the exhaust manifold and then get that on. After that I need to swap the ring gear, install the flywheel, starter, pressure plate, clutch, bell housing and gearbox. There are a few odds and ends up front that need to be finished and then I'll be able to put it in the car. That will certainly be a milestone moment! Bush Mechanic: yeah, brass damper lids would look great! One oddity I see - one carb damper piston seems to have the needle retaining screw visible, but not the other? Are these pistons keyed so they only fit in one way ? My HS2 pison has a slot in the side that keys on a piece on the engine side of the throat, and the needle retaining screw is on the side of the piston towards the front or rear of the engine. Wonder why this is done? So that the screw wont be ingested by the engine if it comes loose. Stromberg CD carbs dont do this and I once had an early Rangie that swallowed the needle screw - it would start and run with a clacking noise, but I couldnt turn it over with the crank handle. Obvious when the head came off, (which also involved a brken head bolt), and then the carb got dismantled to verify. Screw was VERY flat!.